WEATHERSFORD, Conn., Oct. 24. — Grasping in his hand two pink roses which had been brought to his cell, and well nigh speechless with terror, Emil Schutte, triple slayer, former storekeeper and constable of Haddam, was hanged today at the State prison. His only utterance was, “Well, goodby,” as the death cap was drawn over his head. Our rose-clutching former storekeeper was a German immigrant with a famous temper who did well for himself in Middlesex and tyrannized his wife and his brood of seven sons. The weakness of the “despotic patriarch” gambit lies in its tendency to incite the clan to vengeance. And in this case, the clan had the goods on Emil Schutte. In 1921, after Schutte threatened his wife with a gun, his sons protected the mother and shopped Schutte for four different shooting-arson murders: that of Dennis LeDuc, a former Schutte farmhand found burned to death on the property; and, that of the three-member Ball family, who were Schutte’s feuding family rivals. Though evidence in the LeDuc case was too weak to try, the Ball case was more than worth its clutch of roses. Emil’s son Julius Schutte testified that as a teenager, he had helped his father set fire to the Ball house early one morning in 1915. 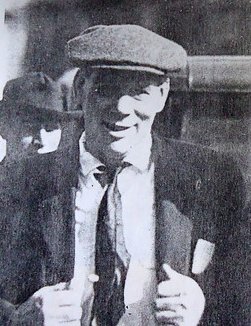 Emil Schutte shot them dead as the fire flushed them out of the house. The deaths had initially been ruled accidental, but Julius’s testimony was powerfully corroborated when the Ball graves were unearthed to reveal spent bullets that time had insensibly coaxed out of the blistered cadavers. So … pretty compelling evidence. Here’s a three-part series on this locally notorious crime: I, II, III. Or to commemorate it in the flesh, drop by Middlesex’s “Cremation Hill”, which got its name from Schutte’s pyrotechnics.